This game is recommended for people who like 7 Wonders. 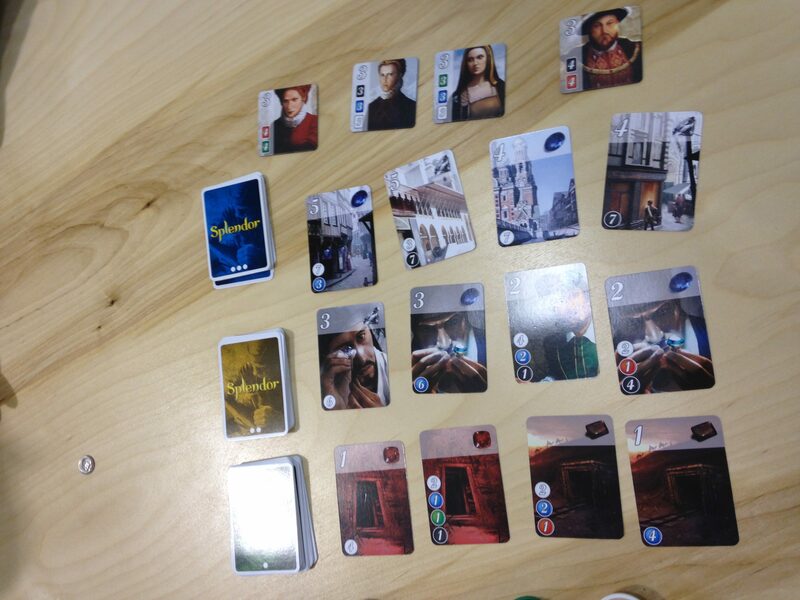 Since we love 7 Wonders, we decided to try out this game. First, game play is nothing like 7 Wonders, but like 7 Wonders, your strategy can easily be foiled by the plays of others. Since gold coins can be so useful, they tend to disappear quickly at the beginning of the game, and some players hoard them. 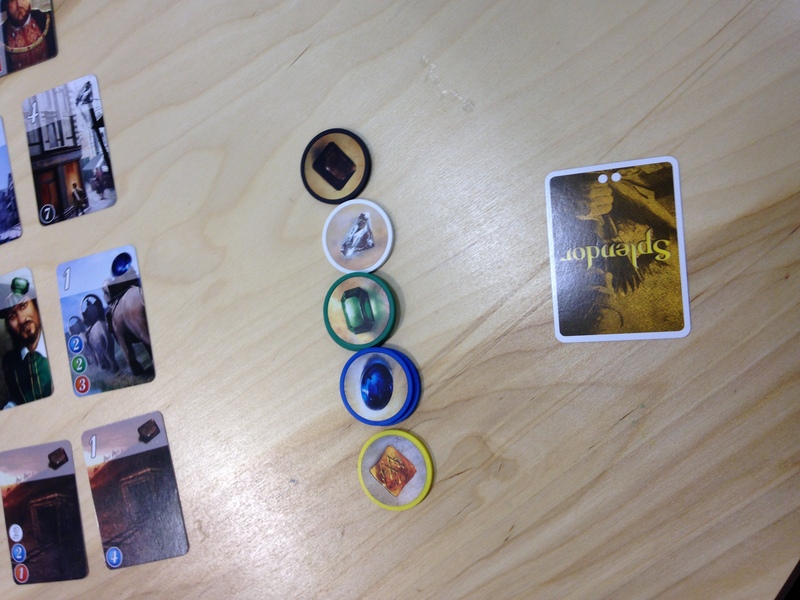 The first few times we played everyone reserved a card and took a gold coin on their first turn. This strategy can work out well if you choose the right card to reserve. The game moves pretty quickly because you have limited options when it comes to actions: take resources, play/buy a card (spending resources), or reserve a card. Even when someone takes the card you wanted, it’s pretty easy to adjust your strategy. Cheap resources can be extremely useful, especially later in the game when you’re trying to accumulate the resources you need for a Noble. The second time we played, one of our friends got a little confused about how to go about getting a Noble (he thought he could buy one like any other card), so that messed up his strategy a bit. It’s also important to keep in mind the order of play. If player 1 reaches 15 points first, everyone else has one last turn to try to get more than 15 points. If the last player reaches 15 points first, the game is over. Reserving a card that is the only resource of that color on the board. If it takes a while for this resource to turn up again, you can really have an edge. The downside is if this card is pretty expensive, it might take a while for you to play it. Ignoring the gold coins and focusing on the low cost resources. This can really help you get a decent stockpile of resources. One game, Professor had several turns in a row where he was able to take a card for free because he had so many resource cards. Going big. Getting the high cost and therefore high point value cards as quickly as possible. This can easily leave other players in the dust, but the risk of not being able to collect the resources you need is a bit greater. Focusing on resources needed for the Nobles. Nobles often have two or three resources in common, so if one Noble wants 3 blue, 3 green, and 3 red while another wants 4 blue and 4 green, I might go for blue and green resources above all others. This can make it easier to obtain Nobles one right after the other. Overall, it’s a quick fun game for a small group.